The U.S. Department of Agriculture (USDA) is worried about an impending nationwide sugar shortage. This is the reason, officials said last week, that they gave farmers the green light to plant Monsanto’s previously outlawed genetically engineered Roundup Ready sugar beets. Currently, 30% of the world’s sugar is produced from beets. Ironically enough, the USDA just weeks ago released its latest set of dietary guidelines for Americans, which place stronger emphasis on the importance of reducing calorie consumption and avoiding things like trans fats, refined flours — and added sugars. “The 2010 Dietary Guidelines are being released at a time when the majority of adults and 1 in 3 children is overweight or obese and this is a crisis that we can no longer ignore,” said USDA Secretary Tom Vilsack in an official press release. The calm before the storm. Three CMEs are enroute, all a part of the Radio Blackout events on February 13, 14, and 15 (UTC). The last of the three seems to be the fastest and may catch both of the forerunners about mid to late day tomorrow, February 17. Watch this space for updates on the impending — G2, possibly periods of G3 — geomagnetic storming. Watch Today’s Space Weather for the most recent activity. A strong wave of charged plasma particles emanating from the Jupiter-sized sun spot, the most powerful seen in four years, has already disrupted radio communication in southern China. Libyans are mobilizing for a “Day of Rage” today on February 17. Protesters in the early afternoon, according to a member of the Libyan Youth Movement, were reported to be moving to the Security Headquarters in Benghazi. The protests are said to be gaining numbers and are headed for Maydan al Shajara once more, a location that had been the site of gunfire and petrol bombs. The same individual also reports shortages of medical supplies at Al Bayda hospital and urges international health organizations to help out. And the movement member shared reports of people in Benghazi managed to chase away “pro-government Gaddafi thugs” by throwing rocks at them. 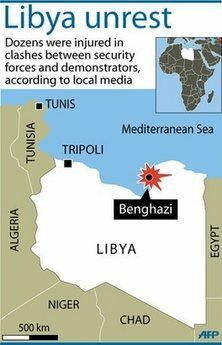 Many in Libya believed ahead of the “Day of Rage” that the Gaddafi regime was planning to threaten Libyans with live fire and the targeting of family members if they participated in anti-government protests. Also, it was reported that Gaddafi was having government employees go protest at pro-Gaddafi rallies, and, if they refused, they would be fired. CLEVELAND – Wow. Last week was a busy week for weather records across the United States. 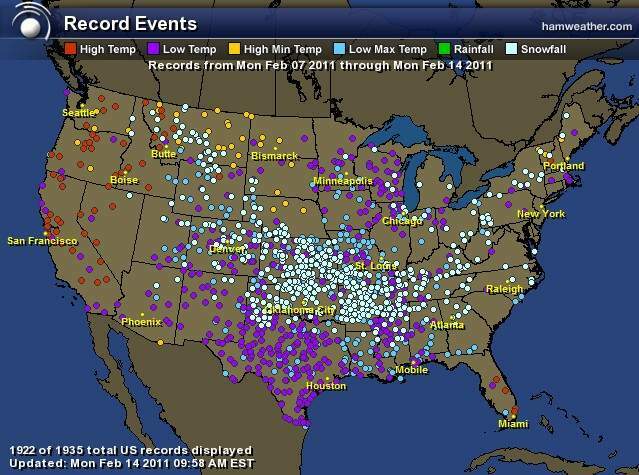 From Monday, February 7, 2011 through Sunday, February 13, 2011, 2,219 new records were set. The majority were for cold temperatures and snowfall. Out of the 2,200 records, 655 were for new record low temperatures; 590 were for new record low high temperatures for a particular day; 573 new records were set for daily snowfall. Only 66 new record high temperatures were measured last week. I imagine he has to say it, but Bernanke is wrong when he says US monetary policy has nothing to do with international commodity prices. At the height of the Egyptian crisis, which was partly driven by rising food prices, Bernanke couldn’t say, “Oh yea, US policy economic policy is part of the problem in Egypt.” This attitude, however, is both prevalent and respected, and it’s largely wrong. First of all, commodities as a group are not commoditized – they are not all the same. For instance, the amount of gold in the world is largely fixed relative to annual gold production. Along with its historical position as a store a value, Gold’s consistent volume about ground is a primary reason for its currency-like quality; i.e. almost entirely driven by overall liquidity. Corn production, on the other hand can vary greatly from year to year given the amount of land devoted to it and the weather. Oil is somewhere in the middle because production can vary, but the worlds known reserves are relatively fixed. 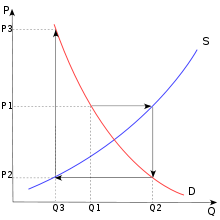 The resulting differences in price volatility have been studied ad nauseam and are most simply articulated by the so-called ‘cob-web model’ (see chart below).